The unnamed narrator returns to his boyhood town for the funeral of an unnamed person (Let me add myth to the mash up list). Distracted by unsettled emotions stirred by seeing his old stomping grounds, the narrator wanders down the lane to neighboring Hempstock Farm. There, he talks to Ginny Hempstock, and inquires about Lettie, her daughter and his childhood friend. He remembers Lettie's claim that her backyard pond was actually a vast ocean. When he sits and looks at the pond, he "remembers it, and in remembering, remembers all." Lettie, her mom Ginny and the Hempstock granny are no ordinary trio. Old Mrs. Hempstock claims, "I've been around since the moon was made," and these ladies know the magic of "snipping and binding". He recalls taking refuge at their farm after an opal miner renting a room in his parents' house takes his dad's car and kills himself in it. Soon after this, the boy runs to Lettie's when his new babysitter, Ursula Monkton turns out to be a terrifying monster who knows everything about him. Not only that, but she claims to have wormed her way into this world from boring a hole in the boy's foot and traveling up to his heart! Ursula is a truly frightening thing, and Gaiman has wicked fun in creating her. She is, in turns, a flea, a dirty mess of flapping canvas, a beautiful woman who has transfixed the boy's father, an alien from another time who tells the boy, "I've been inside you and I'm always watching you." Her defense in being creepy is that, "It's your fault. You brought me here. You tore a hole in Forever." Indeed, it's a dangerous thing for the boy to "be a door." When Lettie and the boy band together to fight Ursula and "send her home" they must deal with supernatural varmints, or as Lettie calls them, Hunger Birds. These ravenous critters not only peck and injure, but they devour the world, part by part. I won't tell you what happens except to say that the boy is tested in every way. For one, he must remain alone all night in a fairy ring stalked by visions and specters who try to coax him out of the safe zone. Gaiman's magic is quite creative, and the last section of the book blossoms to a cosmic level. Gaiman's visionary language is brilliant, and his message transcends the bounds of the fantasy genre. Highly recommended. Neil Gaiman is one of my heroes. Not only as a writer, but for the snippets of personal perspective he shares. I agree. He gets very cosmic with his vision in this novel. 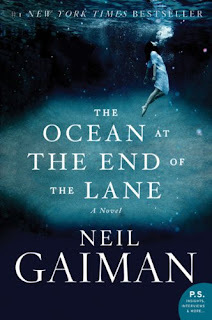 One of my favorite Gaiman books. Great review. What a lucky bunch of students. Yeah, they seemed to really like it, especially the super-strange antagonist. Wow!! I bought this book eons ago, and have yet to read it. I have to dig it out and get to it now!!! Great Review Catherine. I've had a heckuva time being able to concentrate on a novel these days with all of the political turmoil. So, you know this one has to be good. Loved this book! Gaiman always enchants me.